Didn’t I tell you the giveaways are coming? I’m a woman of my word! Here’s a mega giveaway from one of the best British brands available in our country–Warehouse! As stated on my current header/banner ad, Warehouse is opening another branch at Powerplant Mall this August 10 (Friday). 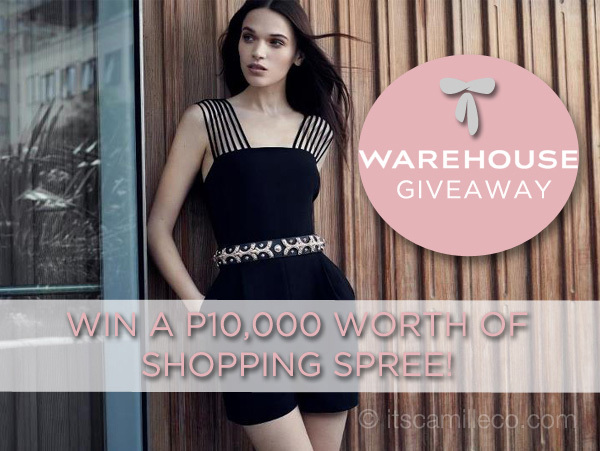 To celebrate this new addition to the family, Warehouse is giving one of my lucky readers a P10,000 worth of shopping spree at Warehouse! How generous! I wish I can join too! Unfortunately I can’t, so I might just drop by this weekend to avail of the 20% off on all items. You, on the other hand, can join my giveaway AND drop by Warehouse, Powerplant Mall for the special opening sale! Make the Warehouse announcement photo your Facebook cover photo. Grab a similar photo to the one I posted below here. Post this as your Facebook status: “Warehouse Philippines opens in Power Plant Mall on Friday, August 10!” Make sure Warehouse Philippines is tagged in your status. This contest is open to Philippine residents only. No multiple entries please. Deadline for entries is on August 9, 2012 at 12 noon. Winner will be chosen via Random.org and announced through my Twitter. I sent you a tweet and an email..I wonder if you received them..
oh nooooooooooo. :( oh well. late uwian form duty. di umabot. Ate Camille, when will you announce the winner? My favorite blogger! :) More power to u! My facebook profile does not have a cover photo for I am not using the timeline. Uploaded the photo on my wall (as public) instead and made it my profile picture. Question. I really want to win but I am not in Facebook Timeline. Can I just upload the picture and tag it? Omg. I hope I win this. What if I’m not on timeline? Can I share the photo instead? That is an amazing giveaway! Diana Q. de Ocampo, Jr.
Btw, I’m not on timeline, so I shared the photo instead and posted as status. Thanks!